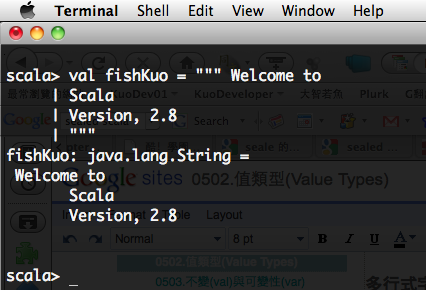 Scala 對映直接使用 java.lang.String. 除了 String 類型以別名(Alias)方式使用原生 JVM (java.lang.String) 或 .NET CLR 平台 String 之外, 其它的型別, 都以 Scala._ 套件中載明對映 Java 的 API 關係, 優點表現在與 Java 互操作性時不會帶來因類型轉換所造成的性能耗損. The difference between this class and WrappedString is that calling transformer methods such as filter and map will yield a String object, whereas aWrappedString will remain a WrappedString. scala> val x = """